Control floating and submerged weeds in ponds and around docks. Quarts for $41.00! Dibrox® herbicide effectively controls a wide variety of submerged weeds, such as milfoil and hydrilla. Suitable for treating small areas, such as around a dock or swimming area. For a more complete solution, we recommend using additional pond weed and algae control products. 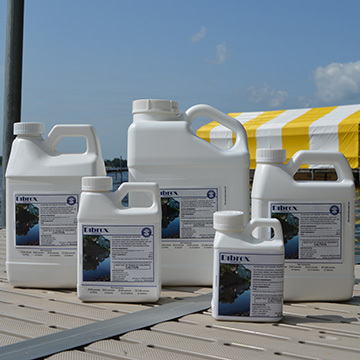 Dibrox® herbicide is quickly absorbed by submerged plants like milfoil and hydrilla, allowing for aquatic weed control to be obtained in small areas of large water bodies. No fishing or swimming restrictions. Refer to your state's regulations for use of Dibrox® in public waters (lakes) and for permit information. Some states may require a license, or similar certification, in order to apply this product. See our Video Demonstration to view how easy it is to apply Diquat herbicide. We received the product yesterday with the boat applicator. We had to charge the battery even though it said it would come fully charged. After 9 minutes on a full charge the battery died and now the boat is stuck in the middle of the pond. Battery was supposed to last 20 minutes. Now I'm wondering if it will even work on the duckweed. Disappointed! I had duckweed all over my pond that it looked like you could walk on it. I purchased just a quart to see if it would work. I sprayed the 32 oz. to 2 gallons of water in a back pack sprayer on a Thursday evening around 4:30pm and my wife sent me a picture on Friday at 2:00pm and at least 15 feet all around the edges were turning brown. By Sunday the pond started to clear up but after a week the duckweed was back but very thin so I purchased another half gallon. I treated a 1/8 to 1/4 acre pond covered thick with Duckweed. I applied Dibrox two days ago, mix; 18 to 20 Oz to 1-1/2 gallons of water in a garden sprayer with the nozzle adjusted so it dispensed rain drop size droplets. In two days Duckweed is almost all TERMINATED. Only dead brownish duckweed remains after two days, even the middle area where my sprayer won't reach is dead. In a couple more days it will be totally gone!!!!! Easy...…. My pond was filled with hydrilla. It completely solved the problem! Fish friendly. Has anyone used this on Wigeon grass? thanks. My pond is 100'x150' and was completely covered with duckweed. It is full of fish, frogs, turtles and we have a swan, 2 geese and 6 ducks. I was afraid to treat it with ANY chemicals but I took a chance on this product based on other's comments. It worked like magic - took about 8 days to totally clear the pond. I mixed 18oz with one gallon of water and simply sprayed the outside perimeter - a second treatment is not going to be necessary. I did not have one dead fish, frog, turtle, swan, goose or duck! I love this product and urge anyone with duckweed to use it with confidence. used this product for the first time 2 weeks ago...within a few days plants were dying, after a week it had done the job! Will definitely buy again. This product was beyond amazing in ridding my pond from weeds! Koi fish didnt seem to mind either. Easy to use with great results!